Last week I promised to tell you a bit more about the charm exchange I’m involved in and how it works. 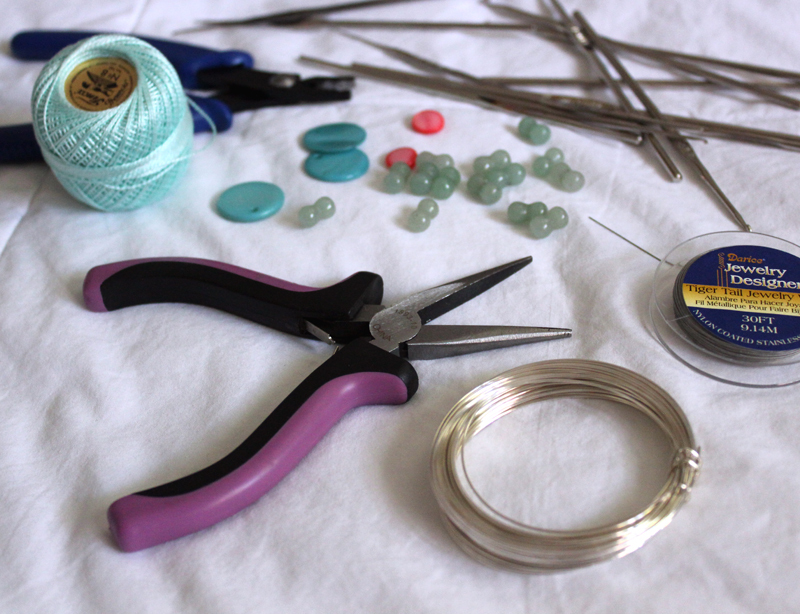 A charm exchange is a great opportunity to make jewelry, hone your skills and try out new techniques, learn from your fellow artists, and make new friends. I bet you’ll want to start an exchange too! Here’s how it works. Everyone chooses a theme for their bracelet or necklace, and over the course of the year, each artist will make two charms for each person based on their themes. Maybe it will make more sense if I use myself as an example. 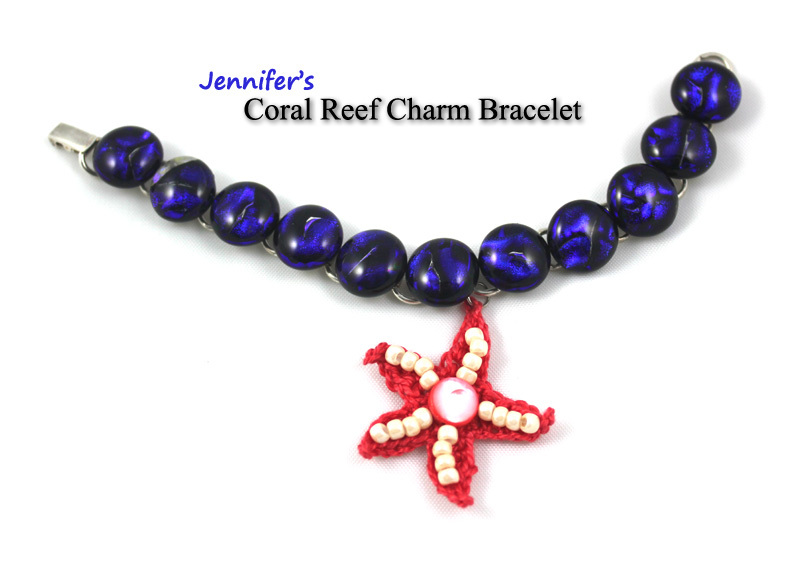 I chose the theme coral reefs, so to start it off, I crocheted a starfish and attached it to my bracelet. At the first meeting, Annie worked up the exchange list (alphabetically ordered) and we all exchanged our necklaces and bracelets with each other. 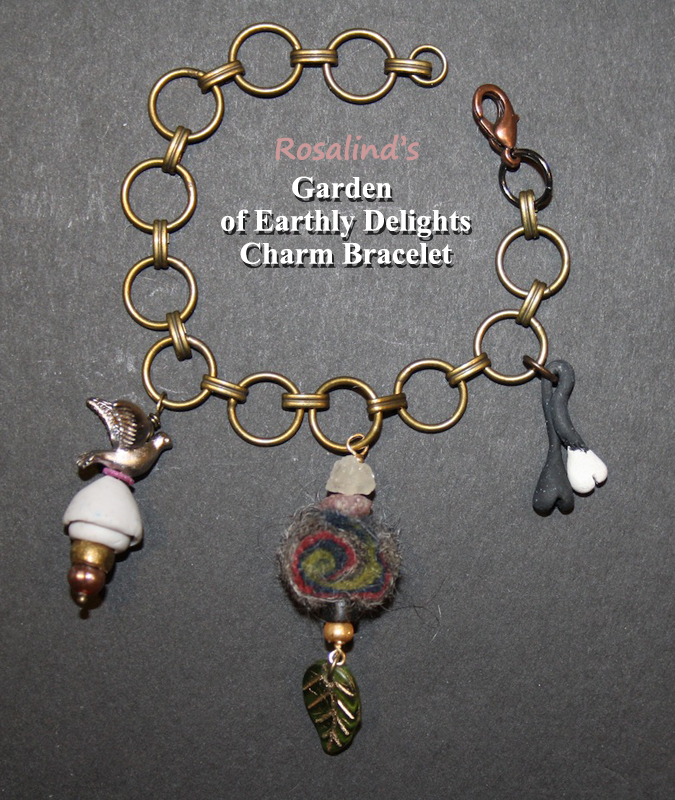 Now over the next two months, Rosalind will work on my bracelet, while I crochet charms for Erikia’s necklace. Erikia will work on Annie’s, Annie will work on Alexandra’s, Alexandra will work on Sylvie’s, and Sylvie will work on Rosalind’s. It’s a really good thing we have Annie to keep it all straight. It will be so much fun to see how each piece progresses from beginning to end as we all add a bit of our handiwork. And I’m excited to be able to share our progress here with you. Are you excited to see what we’ve done so far? Here are some photos of everyone’s pieces at the start of the exchange. 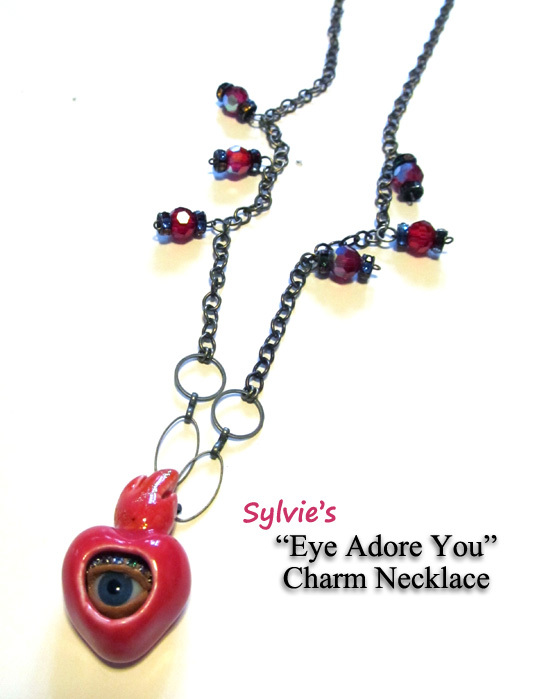 Sylvie is really into eyes and hearts, which led her to create the clever theme “Eye Adore You” for her necklace. 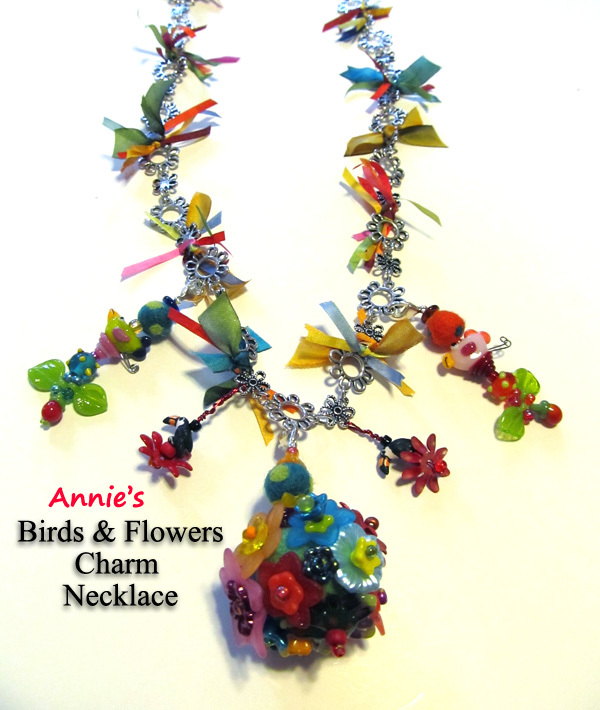 Annie’s theme is birds and flowers. Can you spot all the birds and flowers she’s added so far? 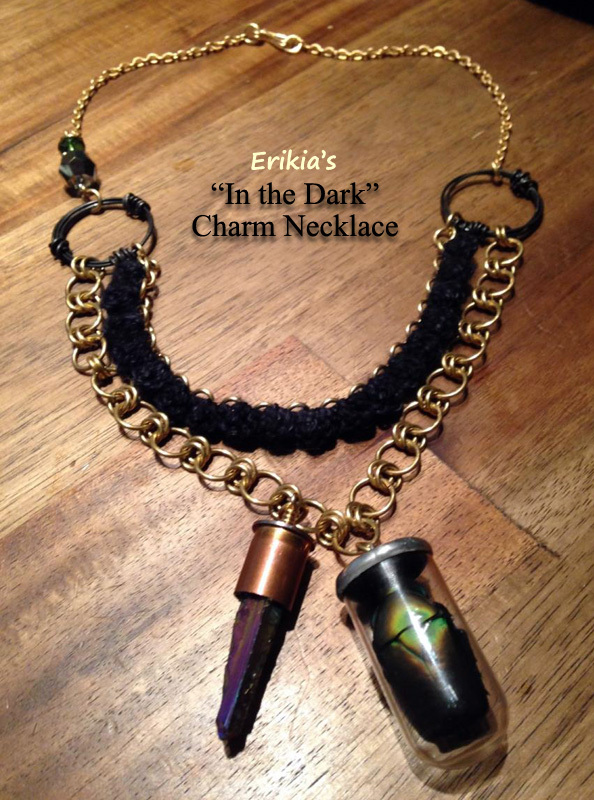 Erikia’s theme is “In the Dark.” The charms Erikia created to start off her necklace include a bullet casing with an opal-colored glass crystal and a mini test tube with an iridescent green beetle inside. Rosalind’s theme is “The Garden of Earthly Delights.” Bosch’s masterpiece will provide plenty of inspiration. 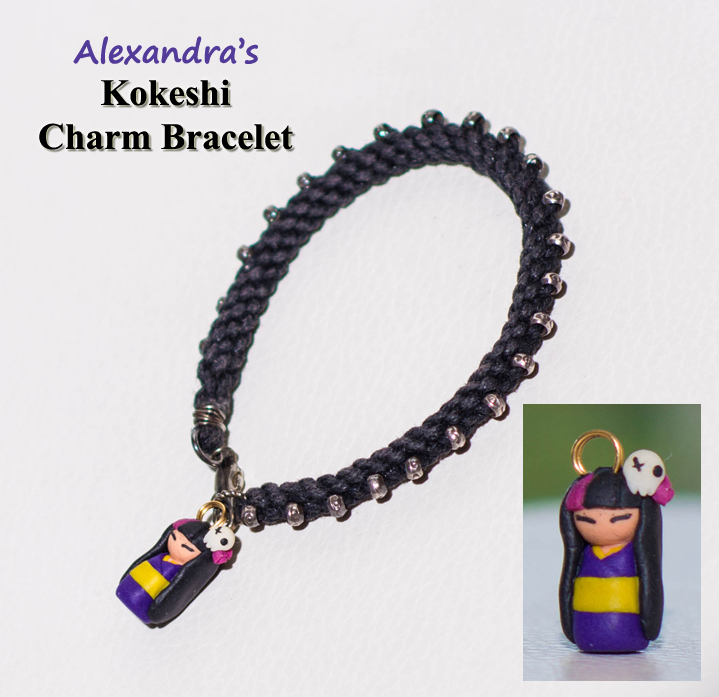 Alexandra’s theme is Japanese Kokeshi dolls. My theme is coral reefs, including the animals and plants that call them home. Sylvie’s box (left) for her “Eye Adore You” charm necklace and Annie’s box (right) for her Birds & Flowers charm necklace. We can also make a box or bag, inspired by our theme, for our jewelry piece to travel from person to person in. 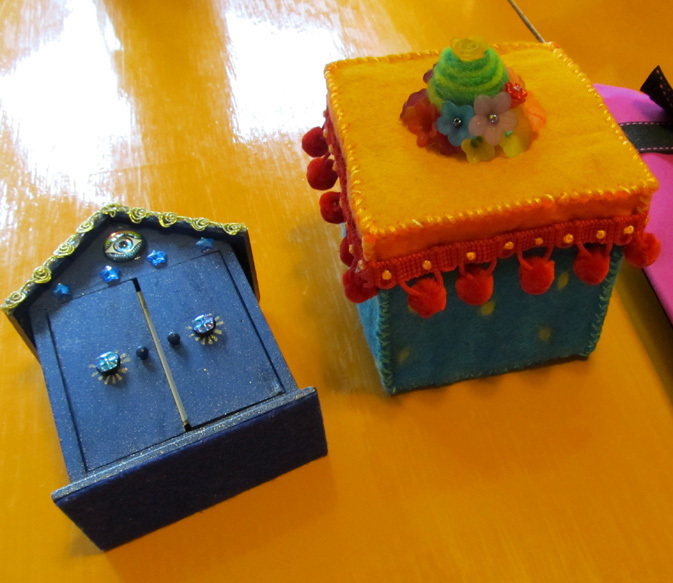 Sylvie and Annie made such nice boxes, I decided after the first meeting to try to make a box of my own. 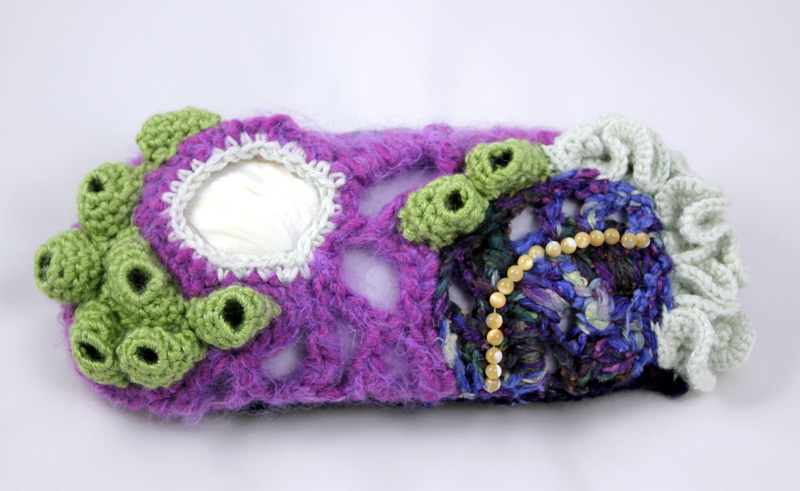 Inspired by the Smithsonian Crochet Coral Reef exhibit, I tried my hand at making a freeform crochet reef box. It was my first ever attempt at freeform crochet. You might guess, given my affinity for patterns, that this was a challenge for me, and it was at first. Eventually I was able to let loose and go wild. I’m not sure it’s a success, but it was sure fun to try. A charm exchange is a great way to make fun things and make friends. You should start one too! 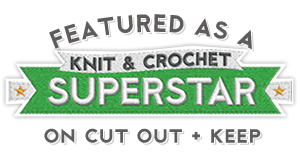 Categories: Friends, Make It | Tags: artist, charm, charm necklace, community, crafts, diy, exchange, friends, inspiration, jewelry | Permalink. Looking forward to see them “finished” and what each one of you came up with. Wonderful! Thank you for sharing this Jennifer. Hi, Vanja! I had a feeling you would enjoy the idea of a charm exchange. It should be a very fun and creative experience!